Today, the sailing life reared its head first thing this morning when the subject of vectors was raised. Anyone remember vectors from high school math? Me? Vaguely – I would have to google it. Google it. Says, I have enough interest to pursue the topic further, but I will delay this pursuit, perhaps indefinitely. But, my husband was persistent. It seems vector diagrams are an important skill in charting a course to sail, especially if the power fails and the GPS and autopilot die, so I will not spare you our discussion. If you are still with me, vector drawings are simply straight lines that hold meaning. In sailing, vectors can help determine how to travel from point A to point B, factoring in wind speed and tidal force. Here is a picture of my husband demonstrating how to use callipers and a chart plotter to create a series of vectors. By drawing vectors, he determines the number of hours, and what direction to take to travel from one point to another. Callipers vary in style, Our callipers are gold-coloured, and the “legs” can be moved about to measure distance. 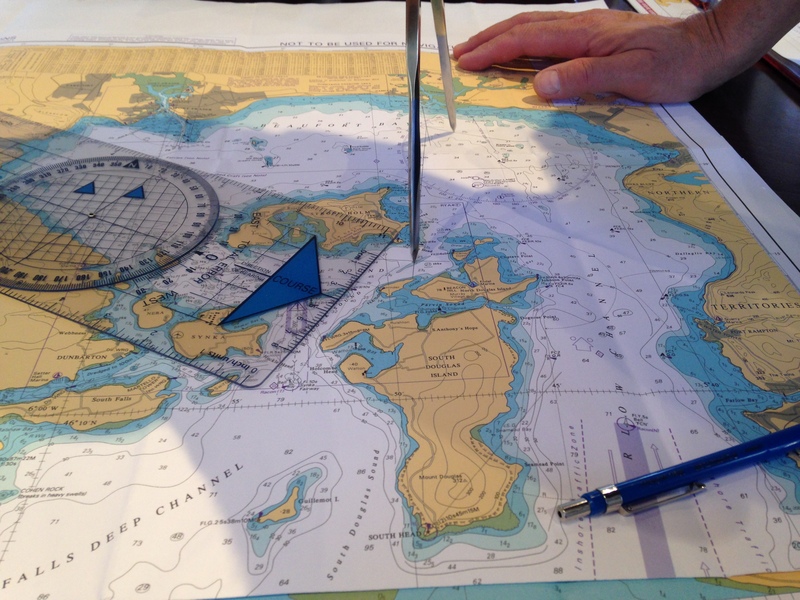 Meanwhile, the chart plotter is used as a straight edge, and the compass rose in its center is used to gauge proper sailing angle. My husband is completing an on-line Day Skipper theory course. He is on section 4 of 12 at the moment. I will be starting this course next week. With practice, our goal is to manually calculate our sailing position within seconds. Hey! New reader here :). My husband and I are considering a sailor’s life as well… still in the research and development phase. I’m going to try to read through your blog today to see if I can pick up a few lessons-learned!